Kombucha tea has been around for thousands of years. It is a beverage that could be easily brewed at home. Sweetened tea is first combined with vinegar and a symbiotic colony of bacteria and yeast, also known as a SCOBY (or the mother culture). It is then left to ferment for several days to weeks. The end result is a carbonated, probiotic beverage that varies in tartness and sweetness depending on duration of fermentation. Probiotics are healthy bacteria that can improve digestive function and strengthen the immune system by restoring the balance of bacteria in the intestines. Probiotics can help to improve the health of the gut microbiome, which many consider our second brain. Other probiotics include yogurt, kefir, sauerkraut, miso, and kimchi. A healthy digestive system is not only critical for strong immune function and hormonal balance, but also to ensure our bodies absorb the nutrition it needs from the food that we eat. 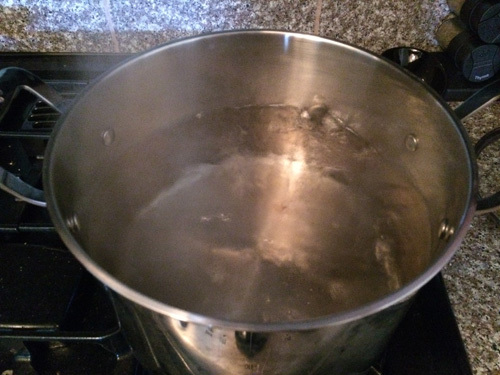 I love drinking kombucha tea, but because it’s rather expensive at $4-6 a bottle, I brew one gallon every two to three weeks. More information on kombucha. While there is much anecdotal evidence surrounding the benefits of drinking kombucha tea, there is a lack of scientific research on humans that can back the numerous personal accounts on kombucha’s healing properties. However, studies on rats suggest various benefits of kombucha: may repair damage caused by environmental pollutants, may be helpful in the treatment and prevention of diabetes, and may be useful in preventing peritoneal adhesions (the development of scar tissue in the abdominal cavity). 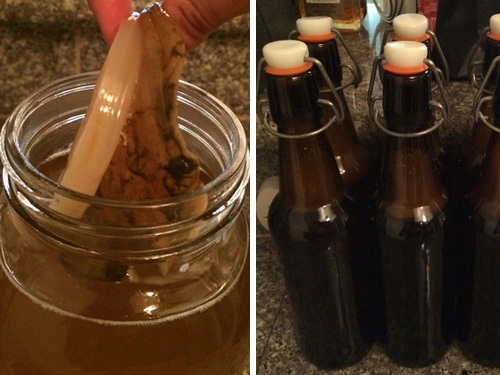 Additional research needs to be conducted to confirm kombucha’s health benefits. Kombucha can be brewed with various types of tea and also flavored with a variety of fruit, juices, and spices. 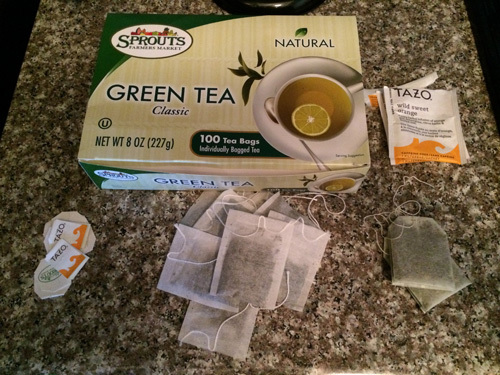 I typically use a combination of green tea, wild sweet orange tea, and fresh slices of ginger. 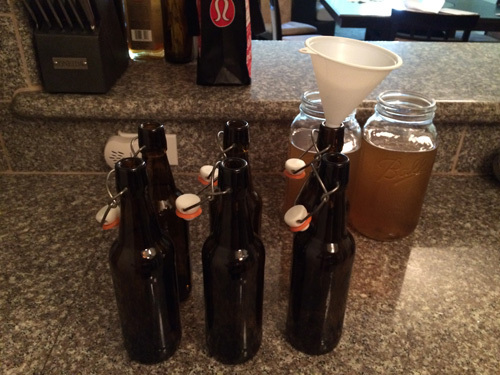 Before starting, I recommend purchasing a Kombucha Starter Kit , which will come with easy-to-follow instructions on how to brew your first batch and each successive batch. When going through the entire brew process, make sure that all the material you are using, including your hands, are always, always, always clean. The last thing you want is to contaminate your batch, kill your SCOBY, or potentially poison yourself. 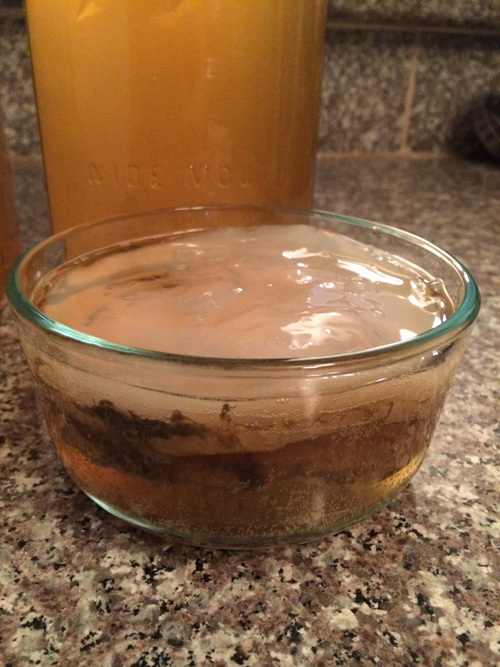 No one likes a moldy SCOBY. Instructions below are for the subsequent batches I’ve made after the first brew with the starter kit. 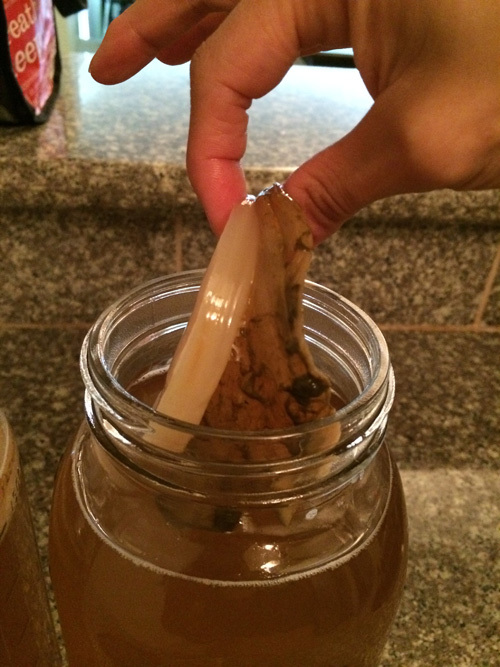 Add the kombucha SCOBY and 1-2 cups of starter tea into the jar(s). 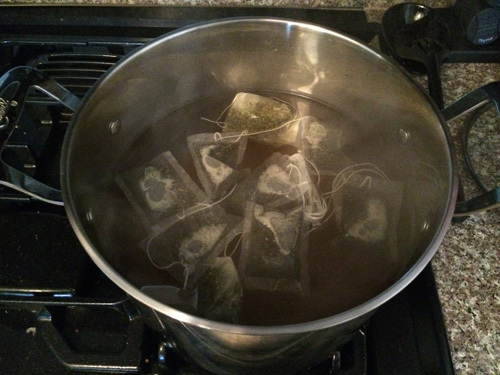 Starter tea is brewed kombucha used from a previous batch. Taste at 7 days. If mixture is too sweet, let brew for a few more days (I brew anywhere from 7-14 days depending on my preference for tartness). 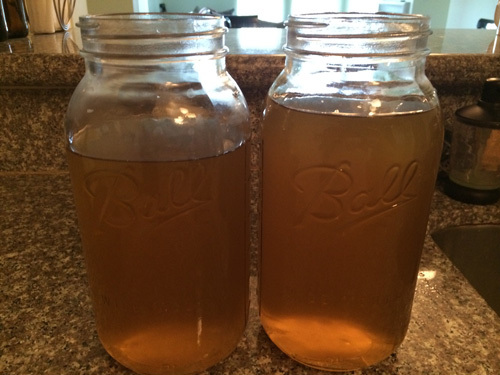 Prior to consumption, kombucha should reach a pH level of between 2.6-4.0. If you’d like to be extra cautious, here are the Litmus pH test strips. 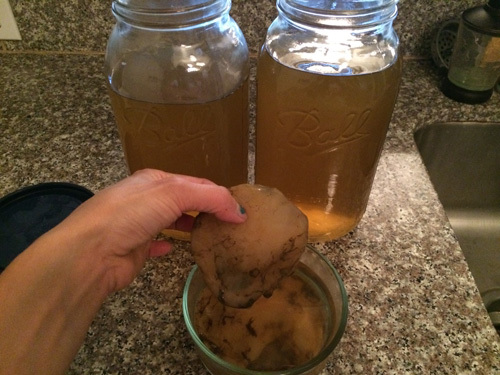 When the kombucha suits your taste, remove the SCOBY(s) and store in the fridge with 1-2 cups of your brewed mixture for your next batch. If desired, you may add fruit, juices, or spices to flavor the batch you will be drinking (not the one you stored away in the fridge). 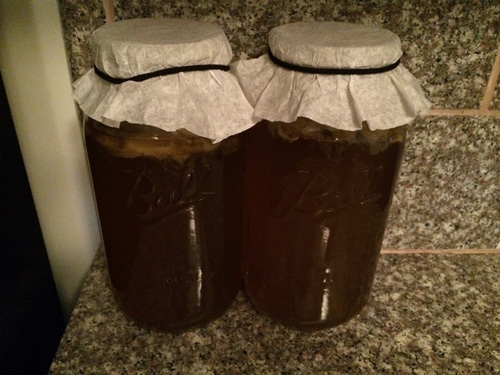 If you flavor the tea, seal the mixture completely with an air-tight lid and let sit for 1-2 days before bottling. You could use the container you brewed the kombucha in. 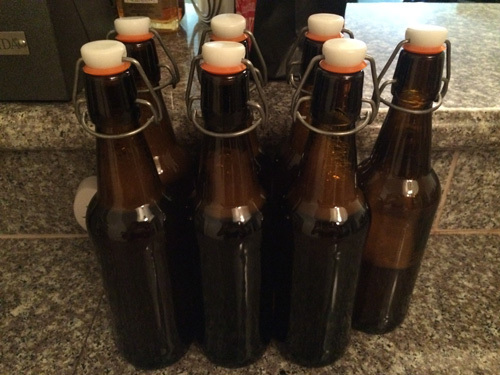 Pour liquid into air-tight, glass brewing bottles . I typically let the bottled tea sit at room temperature for another few days before placing it in the fridge for added carbonation. Cold temperatures dramatically slow the fermentation process. Once it’s in the fridge, you’re done! Let sit, and enjoy your chilled, kombucha tea. 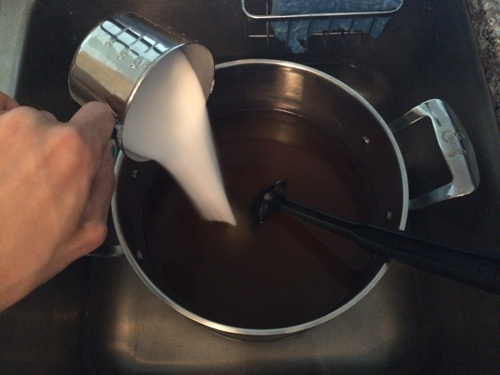 You can take a break from brewing or repeat steps 1-14 to immediately create your next batch.